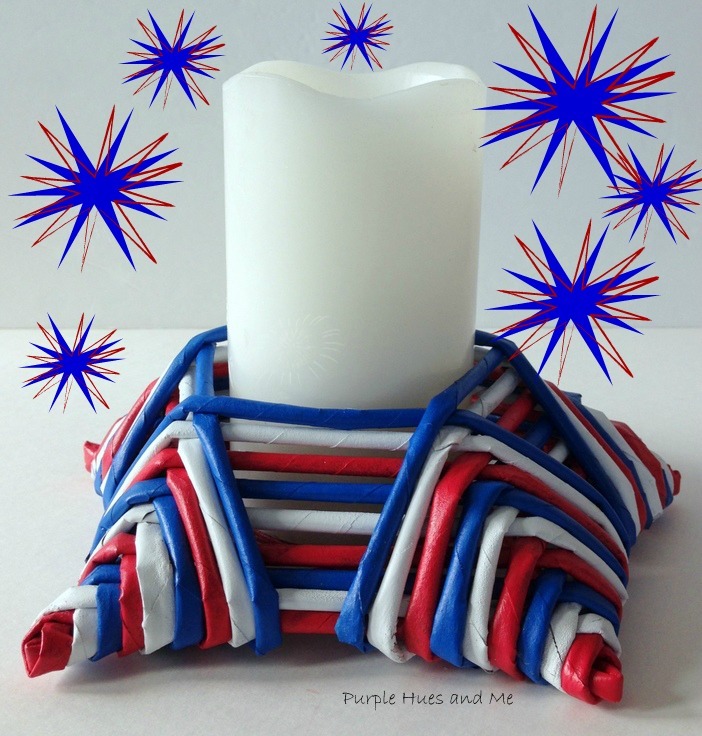 Add a touch of patriotic elegance to your décor with this awesome diy newspaper tubes candle holder or decorative accent piece. It's a super easy recycle project that's inexpensive, costing next to nothing to create, and the best part, you probably have everything on hand to make. With little more than newspaper, a skewer stick, glue and paint, you can create a festive decorative item in red, white and blue, that's perfect for any patriotic occasion or nautical themed décor! Let's begin by folding a full sheet newspaper into four sections horizontally and cutting out on the folds. Then, open the newspaper strips and place a skewer stick at a right angle on the bottom corner of the paper, as pictured. Roll the paper tip over the skewer and continue rolling the paper with fingers and hands pressed down on the surface. You might have to lift the paper tube as you roll to tighten the tube. Continue rolling until you get close to the end point. Add a bit of glue to the tip corner and continue rolling to the end and seal. For this piece, every other tube will be red, white, and blue and I guesstimate will need at least seven tubes for each color plus two extra tubes to make the star, for a total of 23 tubes. * But I always roll a few more tubes, just in case. To paint the tubes, lay down a sheet of parchment paper to paint on, and group the tubes together to paint. It was easy to use the palm of my hand to roll the tubes over while painting to cover the tubes completely. Let dry. To Make the Star: The length of one tube was about 21 inches long. Add glue to one end . . .
and insert another tube to make the length about 42 inches long. Next, fold the longer tube into five pieces, 8 inches long . . .
and shape into a star. Close the two ends of the star by inserting glue to seal. Apply glue to the inside tubes where they cross each other and clamp together until dry. Glue on a wrapping tube a little below the star point and let dry. Begin wrapping around point and straight over to the next point until all five star points are wrapped. Once all five points are wrapped in the same color, the next color is needed by cutting off old tube at side corner or back to hide the new connection and insert the next color tube. In other words, the red tube is cut off at the last wrapping point and . . .
glue is added, and a new, white tube is inserted. Continue wrapping each of the five star points in new color. Continue following the red, white and blue order for the five star points, adding additional tubes as you wrap. When all star points have been wrapped many times and it's the last color of order (blue), cut off excess tube and tuck end tube down inside. Super easy and oh, so unique! Perfect for any patriotic or nautical themed décor! 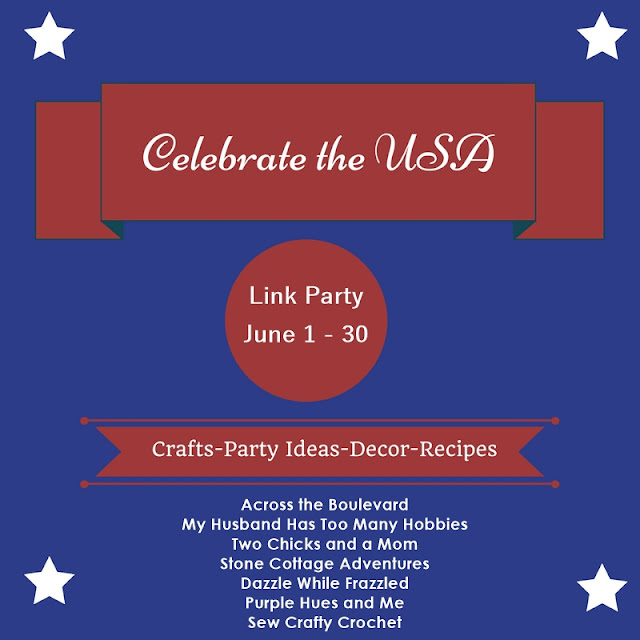 I'm joining a group of blogging friends for a month long Celebrate USA Link Party that opens on June 1st. Pease join us by sharing your all things Red, White and Blue Patriotic Creations! Another fabulous look. You make it look so easy. I would say you have lots of patience to do all of the crafts you do. Love the patriotic look. Gail, this is so creative! I love it! Pinning and sharing. Gail, You are the master of woven newspaper! This is fantastic and totally creative! Such a pretty addition to the table this would make! Pinned and shared. Incredible clever and cute Gail!!! Gail! You are so creative! I've never seen anything like this! It's gorgeous and perfectly patriotic! Wow! How clever to figure this out. Thanks for sharing it with SYC. Oh wow! It looks like a lot of work but it turned out perfectly!